The Bus (Autobus in Spanish) is with the taxi and metro the typical transports in a city. Even though it is not as fast and comfortable as Metro and Taxi, it is always a nice option to travel with. Almost every street count with a special bus lane and that makes it is quite a reasonable fast transport. 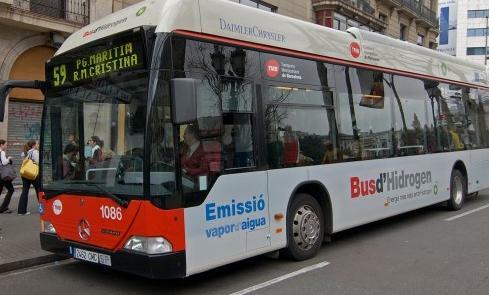 Over 120 of bus lines, Barcelona is perfectly connected by this type of transport. The best option to check the bus tours is to look at the TMB webpage where all lines and their stops can be checked. At the top front of the bus indicates the number of the bus and its origin and destination. Buses are usually red and white (day buses) although there are also yellow buses (night buses). Day buses are usually in operation between 06:00 am until 10:30 pm. Yellow buses or better known as Nit Bus, are only in operation during the night and after the day buses schedule is over around 23:00 until 06:00 am approximately. Nit Buses are composed by only 17 lines and they run through much of the city. Bus stations are usually easy to recognise as they are typical stations and they include a digital sign where it indicates the remaining time for each line bus to arrive. The approximate frequency of every line depends on the time it is but it would be around 10 – 15 minutes (obviously rush hour are more frequent). Buses are usually adapted to disabled people. Tickets are the same as those used in the Metro, Bus, Nit Bus, FGC and RENFE and transfers among all these means of transport are allowed within the following 1 hour and 15 minutes from the first validation of the ticket. This feature is applicable to all tickets except the single trip. To check prices of journeys within Barcelona check Barcelona Metro tickets.